Notes for Talk at Granada seminar “Physics meets the Social Sciences: Emergent Cooperative Phenomena, from Bacterial to Human Group Behaviour” (Wednesday, June 17 (2005)). This has been a staggeringly interesting meeting from my point of view, because I’m in the business of communicating the important ideas that we’ve been talking about to a much wider audience – to the public through books and broadcasts, and to decision makers and politicians through articles and reports, and especially through a Swiss organization called the International Risk Governance Council. I’ve been very much encouraged in my efforts by Bob May, whose pioneering work has been mentioned a number of times. I’m surprised, though, that his most outstanding achievement has not been mentioned – playing with me as a bridge partner on the occasion when we beat the U.S. National team. Bridge a game where you really have to trust your partner, and I’ve also come to appreciate the central role of TRUST when it comes to establishing and maintaining cooperation. Some speakers have mentioned trust explicitly, and it’s also been hiding in the shadows in many of the talks. So when Michael Macy mentioned micro-level uncertainty in collective behaviour, that might at least partly be accounted for by variations in the degree to which individuals trust others and are able to be trusted. When Maria Bertotti talked about welfare measures vs fiscal policy, the degree to which politicians trust particular classes of society certainly comes into the choice. Tom Lenaerts and many others mentioned the Prisoner’s Dilemma and the Public Goods Game, and the problems in both of them largely evaporate if the participants trust each other. Jorge Pacheko looked at networks where individuals adapt their behavior, for example by looking for more cooperative neighbours. TRUST must surely come into the choice, just as it can in Simon Levin’s example of using social norms to sustain and enhance prosocial behaviour. Miguel Muñoz gave us a beautiful picture of communities of agents evolving towards criticality as they tried to understand each other. I wonder whether we couldn’t talk about their striving to understand AND TRUST each other. Henrik Jensen introduced us to his Tangled Nature Model, where you don’t know what fitness is, but where success depends on who you are among. I would add AND HOW MUCH YOU CAN TRUST THEM. Yamir Moreno reminded us that humans are heterogeneous, that our dynamics are ruled by the way that we interact with each other, and above all that HUMANS DO NOT BEHAVE AS THEORETICALLY ASSUMED. Our ability to trust and be trusted is a large part of this. 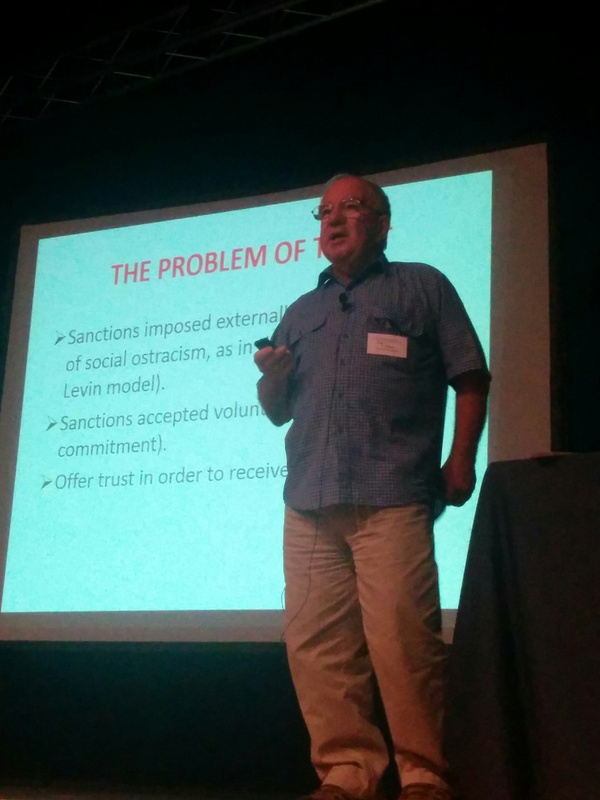 Ángel Sanchez made a very important point when he emphasized the role of REPUTATION in establishing cooperation in dynamic networks. But what else is reputation but TRUSTWORTHINESS? WHY DO WE CHOOSE SOCIALLY RESPONSIBLE ACTIONS OVER DEFECTION, DESPITE THE FACT THAT LARGE-SCALE SOCIAL EXPERIMENTS SUGGEST OTHERWISE? I suggest that a large part of the answer lies in TRUST, and especially in the well-established psychological fact that most of us have a built-in wish to be able to trust, combine with a fear of what that might entail. SLIDE Sanctions imposed externally (e.g. the threat of social ostracism, as in the Tavoni-Schulter-Levin model). SLIDE Sanctions accepted voluntarily (credible commitment). Credible commitment means putting yourself in a position where the person whom you wish to trust you can see that you can’t back out without hurting yourself. There are many ways of doing it. I know that I am oversimplifying this, and that some of you have taken this a good deal further. But this is a meeting where physics meets the social sciences, and I would like to suggest a couple of other possibilities that come from the social sciences, and especially from psychology. Katarzyn Sznajd-Weron told us that, although the relative importance of personality vs situational factors is very important from the point of view of psychology, it has been ignored or forgotten in agent-based modeling. So let’s take a couple of examples. The first is to recognize a well-established fact from psychology, that if children up to the age of one find that they can trust their parents, this can make a great deal of difference to their ability to give and receive trust in adult life, whether it be in business dealings or social relationships. What this means in practice, as I hinted when I mentioned Michael Macy’s paper, is that there is an inbuilt variability through the population in our ability to trust and be trusted, and when we are talking about noise in our models, this might be one of the sources. Another lateral thought comes from the work of the psychologist Carl Rogers. He developed an approach to counseling that is called the person-centred approach. I’ve been a bit involved with this, because I wrote a chapter in the standard textbook on Rogers’ approach where I showed how his approach might be used to tackle some of the problems exposed by game theory. Rogers’ basic approach is to offer trust in order to receive it. By doing this, he finds that clients are much more likely to offer trust in return. I am oversimplifying here, and there are a number of other “core conditions” that need to be fulfilled, but this is a central one. but this is the basis. Incidentally, when it comes to counselling and therapy, there is very strong evidence that it doesn’t matter a damn what particular school or set of beliefs the practitioner follows. All that matters is that a trusting relationship is established with the client. That same precept applies to encounter groups in psychology and counseling, and to our encounters with other people in the wider world. I’ve had some dealing with senior UK civil servants, and it is an unwritten rule wherever possible only to deal with those whom they can trust. Trust is developed in the same way that it is in encounter groups – by progressively testing the water, and above all by showing that one can oneself be trusted, which takes us back to credible commitment. You can even extend the concept to organizations. There was a very interesting paper by William Mishler and Richard Rose in 2001 which demonstrated pretty convincingly that it is possible to evoke trust in institutions even if one doesn’t trust the individuals so much. There is evidence, in fact, that the businesses that prosper most highly are those that can demonstrate convincingly that their customers can trust them because the business puts the customer’s interests first, such as the “refund without question” policy of some supermarkets on the return of damaged or defective goods. The take-home message is that trust is very important for establishing and maintaining cooperation, but there are many different ways to evoke it, and the method needs to fit the situation. We can use different methods in their pure form, or sometimes it might be appropriate to use a mixed strategy, combining methods from different disciplines that all have their own approach and authority.